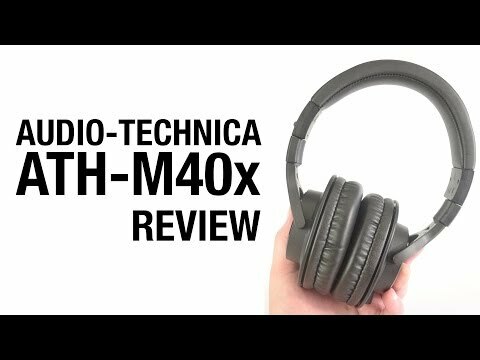 They’re cheaper, but can the Audio-Technica ATH-M40x live up to the expectations set by the more popular ATH-M50 series? The ATH-M40x sell for just $99 and many people say they sound almost or just as good as their more expensive relatives. So, of course, we had to check them out ourselves and see if this was true. Like their older brother, the ATH-M50x, the Audio-Technica ATH-M40x are not a small pair of headphones, and your first clue will be the sheer size of the box here. We’ve seen some pretty big Bluetooth speakers come in smaller boxes. Open it up and the first thing you’ll see is a piece of cardboard that sits on top of the headphones. This holds the carrying pouch as well as the manual and warranty information. Underneath you’ll find the headphones themselves, wrapped around a cardboard “post” of sorts. Take this out of the box and you’ll find it was covering the two included 3.5 mm audio cables. Here you’ll also find a small pamphlet on the locking connectors used on these cables. More on that later. In stepping down the price from the ATH-M50x, Audio-Technica had to cut corners somewhere for the ATH-M40x, and one of these is variety. While you can get the ATH-M50x in a few different color options, there is only one available here. The headphones have a matte black finish with silvery gray highlights for the Audio-Technica logo. As mentioned above, this is a seriously large pair of headphones — after all, you’ve got to put those 40 mm drivers somewhere. This could potentially be a problem as far as comfort is concerned, but luckily that isn’t the case. After wearing these for so long during testing, it’s clear that the ATH-M40x were designed with long sessions in mind. I didn’t start to feel the fatigue so common in larger headphones, and even in warmer weather, I didn’t notice the ear cups starting to heat up. Even though the headband isn’t very heavily padded, this didn’t seem to be an issue when it came to comfort. The ear cups rotate very freely, and though this can lead to easy points of failure in the build, the ATH-M40x feel like a very sturdy pair of headphones. Unfortunate though it may be, we can’t subject our review units to heavy stress testing, but this feels like a tough pair of headphones. Normally we’d be a little concerned about only having a pouch to carry the headphones, with this build quality and with the price being so low, we’ll give these a break. As the ATH-M40x are built with monitoring in mind, you’re not going to find Bluetooth connectivity, or even a mic and remote. This is a pair of headphones built with one and only one thing in mind: listening to music. That said, Audio-Technica has provided a few options as to how exactly to do it. Normally when you see two cables included with a pair of headphones, it means one standard cable and one with a remote. In this case, Audio-Technica has taken a decidedly old-school approach. You do indeed get the standard straight cable, but you also get a coiled cable which, personally, I love. This comes in handy for another reason. While the cables are 3.5 mm on the ends, the ATH-M40x use a proprietary locking connector on the headphone end. While this is handy because it keeps the cable from ripping out if you trip over the cable, it also makes replacing a snagged cable tough. Luckily, the coiled cable has some “give,” making this less likely to happen. One of the biggest differences between the ATH-M40x and the more expensive ATH-M50x is the driver size. The drivers here are 40 mm in size, just slightly smaller than the 45 mm drivers in the M50x. While this doesn’t sound like a huge difference, it does affect the sonic signature. In testing the ATH-M40x, the main thing we wanted to test was fidelity, so I listened to CDs and lossless audio files played from a computer through a Focusrite Saffire Pro 40 audio interface. To see if the headphones played nicely with mobile devices (which they do), I also did some listening on a Moto X. During testing a listened to a wide variety of music from multiple genres and eras. The one area where the smaller driver size makes the biggest difference is definitely the bass, but that doesn’t mean that the bass is weak here, just that it isn’t as strong as the M50x. Listening to Grant Green’s “Iron City,” it feels like the bass should be shaking the room. That said, bass that is boomy to the point of being annoying on other headphones isn’t a problem at all on the ATH-M40x. The midrange is the frequency range where a lot of important audio elements live — vocals, guitars — so this is especially important in studio monitor headphones, and the ATH-M40x get it right. Midrange is clear and accurate, with excellent low-mid depth. The ATH-M40x do a great job of delivering crisp highs with excellent detail. You’ll hear harshness if it is present in the mix, but this pair of headphones certainly won’t add any. The soundstage is often accentuated and exaggerated in consumer-focused headphones, so depending on what you’re listening to, these may sound narrow. That said, mixes that make good use of stereo space will sound excellent on these. The ATH-M40x trade a tight seal for comfort, so while you’ll be happy listening to your tunes, anyone nearby will definitely get at least a hint as to what you’re listening to. Obviously, the ATH-M40x aren’t quite as good as the M50x — if that was the case, Audio-Technica wouldn’t sell both products. That said, it is impressive how close these do get, and stepping outside of the shadow of their bigger brother, this is a great pair of headphones. Long story short: if you’re looking for a great pair of headphones for monitoring or just for listening to music and you don’t want to drop a bunch of cash, these are a great buy. At $99, the Audio-Technica ATH-M40x are an amazing deal.